The Royal Australian Air Force (RAAF) used the Kittyhawk as its main fighter during World War II. The Kittyhawk, the nickname used by the British Commonwealth for later models of the Curtiss P-40 fighter, was a rugged single-engine, single-seat fighter that was heavily armored. 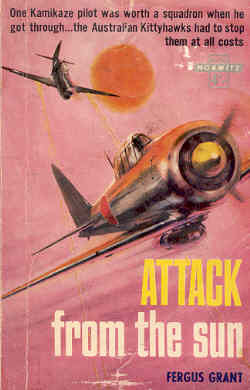 Attack from the sun features Australian Kittyhawk squadrons fighting against Japanese fighters during the Allied invasion of Borneo. The book's last chapter describes an attack by a kamikaze squadron of six Zeros from a base in the southern Philippines. The novel's nonstop battle action probably occurs between about May and July 1945, the period of the Allied invasion of Borneo, but the book does not specify any dates. Cleary's squadron of twelve fighters participates in the battle to capture the tiny island of Salik so that Australian Kittyhawks can use it as a base. Cleary loses six of his squadron's fighters in battle and another on takeoff, so his squadron gets diminished to only five planes by the time the Allies capture Salik. The Kittyhawks based on Salik, including Cleary's remaining squadron, then begin their missions of strafing and guarding the sky against Japanese fighters as the Allied bombing of Borneo continues. Cleary's Kittyhawk goes down in Japanese-held jungle, but he kills three Japanese soldiers in a gun battle as he makes his way to the coast to get rescued. The Australian pilots on Salik suspect that someone among the 100 or so men at the base is sabotaging their planes, and they finally discover an unknown soldier, who had been hiding in an underground bunker, when he goes up in flames after two Japanese Zero floatplanes strafe the island. Cleary's younger brother Bill crashes into the jungle, and Cleary decides to crash land his plane on top of the trees in an attempt to find and save his brother. With the help of a native, Cleary and his brother manage to get through the jungle, take a raft down a river, and get rescued after they get out to sea. The last chapter covers an attack by six Zeros in a kamikaze squadron. The Kittyhawks led by Cleary stop five of them, but one gets through and sinks a ship in 30 seconds. With the novel's concentration on dogfights and ground fighting, the characters show almost no emotion. For example, Cleary loses seven pilots in his squadron, but his chief concern at the time seems to be a rivalry with another squadron leader named Tubby rather than grief for his lost pilots. The only real emotional incident in the entire novel occurs when the plane of Cleary's brother Bill goes down into the jungle, and Cleary feels that he must crash land to rescue his brother. The novel provides no dates, very little with regard to characters' backgrounds, and almost nothing on geographical details. On the other hand, the book excels in its depictions of aerial battles. The Japanese kamikaze pilots portrayed in the last chapter have little connection with historical reality. No kamikaze attack ever occurred off the coast of Borneo from a Japanese air base in the southern Philippines. From May to July 1945, kamikaze attacks took place very far to the north around Okinawa and off mainland Japan. The novel states that the Australians had advance intelligence that a kamikaze squadron may sortie, and then spotters in the Philippines identify six planes heading south. The Allies never had this type of advance notice from the ground during the war, although radar or combat air patrol (CAP) often identified incoming Japanese planes long before they reached their targets. The Zero kamikaze squadron left the Philippines without any escorts, which was not typical during the war since escorts increased the chances that the kamikaze planes would get through to their intended targets. Tubby: While you've been away this has become a serious danger. One Kamikaze pilot is worth a squadron if he gets through. And they are getting through. Tubby: We don't know yet. But we are to stop them at all costs. Cleary: Even by becoming Kamikaze ourselves? Tubby: That's up to the individual. There are no official orders on that. But they must be stopped. Although this conversation makes little sense historically since the Allies had radar picket stations and combat air patrol at that time to limit the effectiveness of kamikaze attacks, the squadron leaders' conversation shows that they consider a suicide attack to not be a fanatical battle tactic if it can be used effectively to stop the enemy. In the final battle scene, Cleary crashes his fighter into a Zero in order to stop the plane from hitting a ship, but he manages to press his safety harness release just in time to escape with his life.